Synopsis: The frontiersman, Hugh Glass, who in the 1820s set out on a path of vengeance against those who left him for dead after a bear mauling. Thoughts: You can tell the summer season is nearing its end when the movie previews shift from action spectacular blockbusters to films aiming for awards season glory. Already this week we’ve seen Joy, David O. Russell’s bid for a best director Oscar nomination and now comes the newest film from the most recent winner, Alejandro González Iñárritu (Birdman: Or (The Unexpected Virtue of Ignorance). 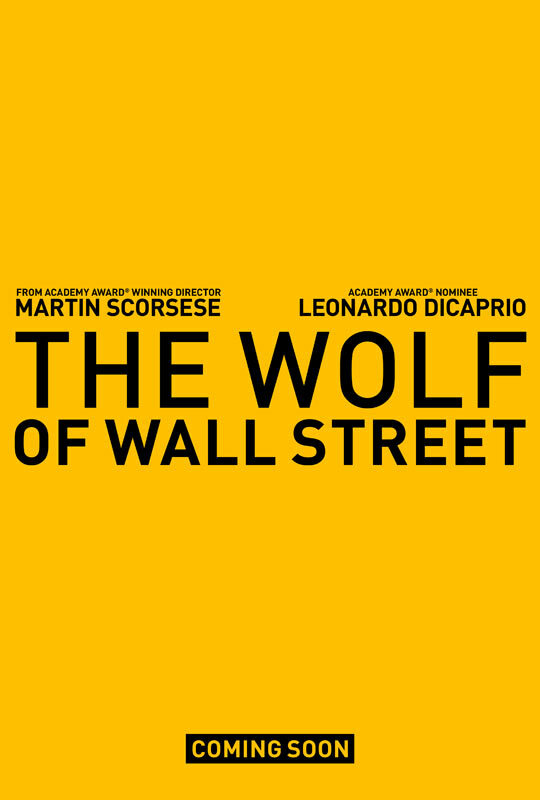 It also marks Leonardo DiCaprio’s first film in two years after The Wolf of Wall Street, surely an effort he hopes will nab him his fifth nomination. I’ve always found DiCaprio to be a good actor that takes himself perhaps just a tad too seriously, a reason why Oscar gold has eluded him all these years. Teaming with Iñárritu is a wise choice as he’s known to push actors out of their comfort zone…just the thing that DiCaprio has needed for some time. 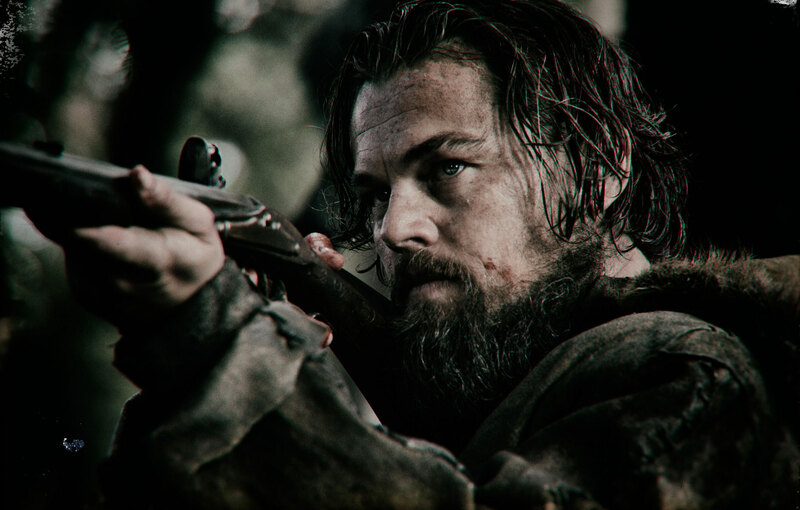 Co-starring Tom Hardy (Mad Max: Fury Road), Domhnall Gleeson (About Time), Will Poulter (We’re The Millers), and Paul Anderson (Passion) there are some stunning images in this first look at The Revenant…this one looks like a tough watch but Iñárritu and his cast have their work cut out for them. Synopsis: A group of brave individuals risk their lives to save the last of the world’s mountain gorillas; in the midst of renewed civil war and a scramble for Congo’s natural resources. 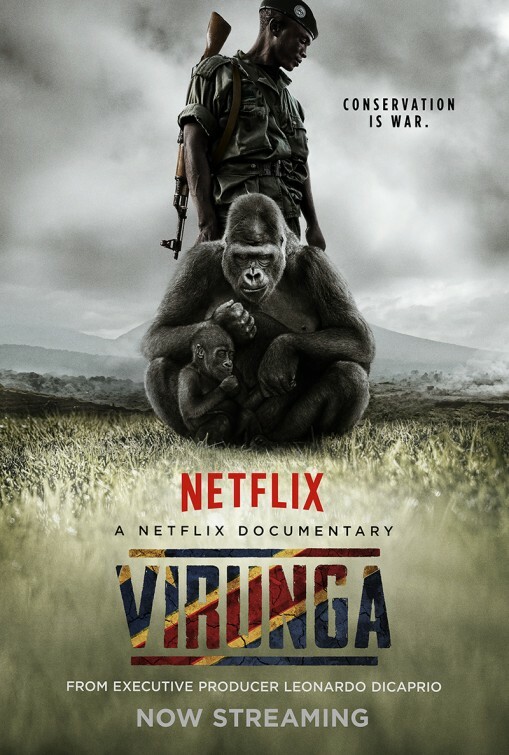 Review: Browsing your Netflix queue you may lock in on Virunga’s cover image, that of an imposing mountain gorilla and young baby sitting in front of an armed solider and have thoughts of other monkey movies pass through you head. There’s a bit of false advertising going on if you think that Orlando von Einsiedel’s Oscar nominated documentary is just about the protection of the gorillas in the Virunga National Park situated in the African Congo because in reality the film is an engaging look at larger conservation efforts underway at this pristine national park. Established in 1925, the park was intended to be a sanctuary for the endangered wildlife population being driven out of their natural habitat by land developers and oil companies. Poaching has become a serious problem with the illegal killing of these protected animals as a way to undermine the necessity of the park and acting as a gateway to have the park become less and less expansive. Following several stories/people that pass through the park, Virunga puts a lot of information out there in quick succession about the history of the Congo as it brings us to the present problem at hand. We meet the various people working to protect the land and all that live and make a living within, from a kindly man that works in the gorilla sanctuary to the rangers that risk their lives stopping the vicious poachers. All well and good for a portrait of life but the film goes a step further by bringing to light investigative journalism that points to oil companies taking extreme measures to ensure their place in the front of the line for tapping into new oil deposits purported to be under the land deemed protected. A French journalist risks her neck to meet with shady sub-contractors that may or may not work from multi-billion dollar corporations while a family-man ranger wears a wire and secret camera to catch officials attempting to bribe him for looking the other way. It’s hard-hitting, eye-opening stuff, shining a light on problems that exist half a world away. It’s no shocker that noted conservationist Leonardo DiCaprio (The Wolf of Wall Street) hung his hat on Virunga as an executive producer, it’s exactly the kind of slick product the actor has focused his humanitarian work on in the last decade. Even if it can feel a bit catch-all at times with its moments of breezy gorilla antics giving way to a breathlessly tense journey through an active warzone, Virunga feels both affective and effective. Make sure to stay until the last credit has rolled. Review: It would be hard to graduate high school without having had to read F. Scott Fitzgerald’s 1925 novel “The Great Gatsby”. A treasured tome for some and a hollow warning on the price of the American dream to others, the novel wasn’t a success when it was first released and only became popular after Fitzgerald’s death in 1940. Over the years it’s been adapted for stage and screen (both large and small) but the key core of the novel’s brilliance has never been truly captured accurately. 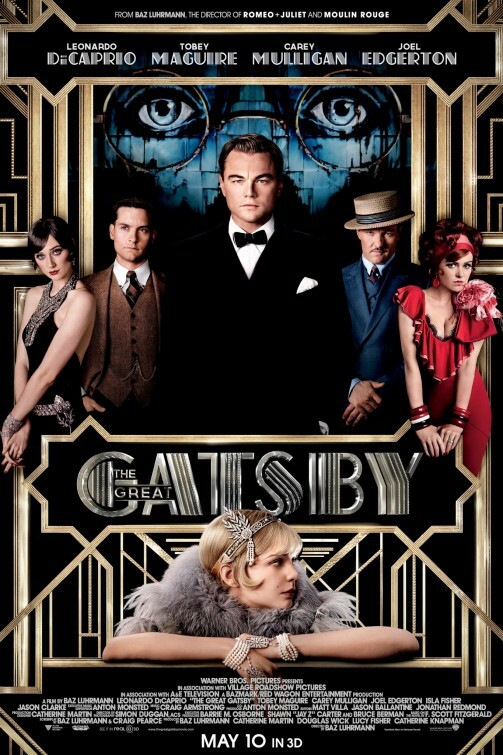 This 2013 version of The Great Gatsby also misses the mark of what made has made the novel so timeless but it does capture the mood and feel of the era the best of any previous incarnations of the work. Yes, it’s over the top, flashy, and delirious at times…but so were the roaring 20’s! Director Baz Lurhmann has been faithful to the book as much as possible and utilized a well conditioned cast to the best of all of their collective abilities. It’s the summer of 1922 and NYC is in the middle of Prohibition and right on the cusp of some major social change. 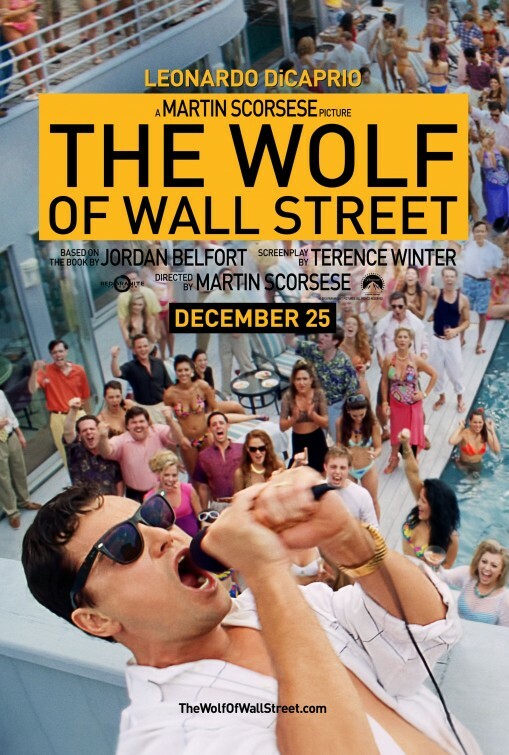 The days of wine and roses are numbered with The Great Depression right around the corner but no one is the wiser as they roll down their stockings, bob their hair, spend money like there’s no tomorrow, and dance the night away in speakeasies and at Jay Gatsby’s massive Long Island mansion. Our narrator/moral center is Nick Carraway (Tobey Maguire) and as the film opens he’s relating a story of love and loss from the icy confines of a sanitarium. Unable to bring himself to speak the words, he begins to write and so truly begins the story of how he found himself a bystander to a doomed love triangle between his mysterious neighbor Jay Gatsby (Leonardo DiCaprio, Django Unchained), his cousi Daisy (Carey Mulligan, Inside Llewyn Davis), and her husband Tom (Joel Edgerton, Zero Dark Thirty). All of the elements from Fitzgerald’s novel come to life under the stellar work of production designer Catherine Martin (who also designed the jaw dropping costumes and happens to be Mrs. Lurhmann). The green light that sits at the end of the Buchanan’s dock and acts as a beacon to Gatsby across the bay, the watchful billboard of a forgotten optometrist, even the classic lines and descriptive phrases are nicely incorporated courtesy of Lurhmann and Craig Pearce’s everything but the kitchen sink script. That being said, even with everything in place there’s a severe lack of “the underneath” as I like to call it. While the characters move around this gossamer landscape enacting acts of love and revenge, there’s precious little sympathy for any of them…which is largely the way Fitzgerald wrote them. That may be hard for some people to get over when watching the film but Fitzgerald didn’t see these people as heroes in need of salvation but as indictments of the time and place in which they flourished. Even so, I kept wishing there was more blood and guts on display rather than just flesh and bone. Strangely, I’m not usually a fan of most of the leads in The Great Gatsby. DiCaprio is constantly mentioned as one of our great actors and while I can give it to him that he’s turned in solid work in the last decade I haven’t thought his work was that underappreciated. He was refreshing in Django Unchained and should have nabbed an Oscar nomination for his efforts but it’s with The Great Gatsby that I finally saw in DiCaprio the actor that I think he should be. The haunted and deeply fragile Gatsby seems the most natural fit for DiCaprio and he’s quite acceptable in the part. Mulligan is making a habit of playing these delicate, bird-like characters and this just seems another exercise with Mulligan using the tricks she’s accumulated in her cinematic wheelhouse. Though I think she’s ultimately well cast, those familiar with her work won’t see anything truly new. DiCaprio’s best friend Maguire is well suited for playing the closest thing Gatsby has to a best friend and thankfully ditches his puppy-dog mumble technique to really deliver as the flawed narrator of the piece that isn’t so innocent in what happens over the course of the film. Edgerton makes a strong showing as Tom Buchanan, a man that doesn’t appreciate what he has until it’s nearly gone. Though having an affair with a mechanic’s wife (Isla Fischer who’s better here than she is in Now You See Me), he clings to Daisy when he sees her getting close to Gatsby. Ultimately, Tom sets into motion the tragic final act of the piece involving the mechanic (Jason Clarke, so good in Zero Dark Thirty and Lawless), all the while knowing what the outcome will be. Special mention needs to be made for Elizabeth Debicki’s strong supporting work as golf pro Jordan Baker, a friend to the Buchanan’s, Gatsby, and Nick. Though she could be viewed as working all sides, in Debicki’s capable hands the role is smoothed out and is the best representation of a character that would believably be living and breathing during the 20’s. Keep an eye on this actress, she’s fascinating to watch. Much has been made of Lurhmann teaming with rapper Jay-Z to bring a modern sound to the film and I was nervous after hearing early reports that the film was sidelined by its soundtrack. So I was happy to see (well, hear) that the music is worked in rather unobtrusively to the film and in some cases works to heighten the happenings onscreen. Lana Del Rey’s spine chilling “Young and Beautiful” is laced into several scenes in a few different iterations, its lyrics and sound perfectly capturing the longing and fears of our characters. Other efforts, like Beyonce’s cover of Amy Winehouse’s “Back to Black” don’t land right but that’s the problem of the re-working of the song not the movie. Filmed in 3D, the first half of the movie is very much like previous Lurhamann efforts…meaning that it’s fast edited within an inch of its life. The editing really represents what’s happening on screen because the first part is a fever dream of excess and confusion. When Gatsby and Daisy are reunited (in a scene that I’ll admit had my pulse racing) the movie settles down and only works itself up again as it careens into its finale. Though it was brought to television in a 2000 effort starring Mira Sorvino, the last time Gatsby was on screen was in 1974 starring Robert Redford and Mia Farrow. While that sounds like ideal casting, the final effort was a dreadful bore – it’s 1 minute longer than this version but feels like an hour. Though this still isn’t the perfect Gatsby, for me it’s dang close. Still without a vibrantly beating heart, the movie swirls and twirls around you and is more engaging than you might think. Ultimately, it’s a film that’s been on my mind a lot in the last few days and one that is worth seeing in the theaters.